Dreams of our helicopter future really took off in the 1940s. But they were still alive and well in the 1970s. The old guard couldn't give up on the commuter aircraft of tomorrow. Like in this December 13, 1970 edition of the Sunday comic strip, "Our New Age." 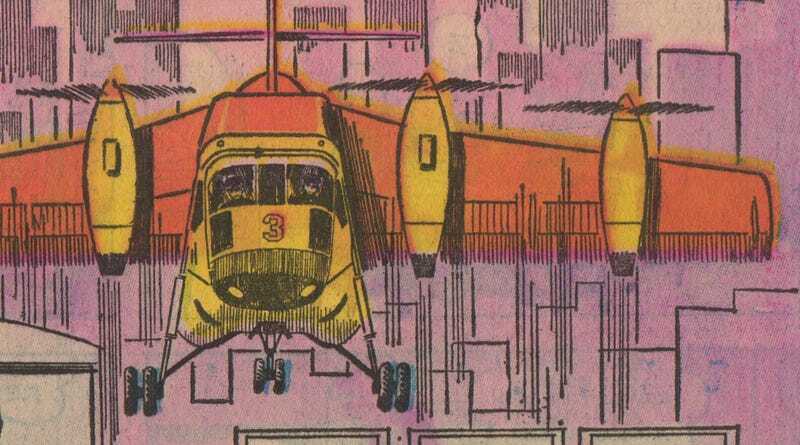 Written by Athelstan Spilhaus, and illustrated by Gene Fawcette, the strip relayed the predictions of futurists who insisted that vertical take-off and landing aircraft (VTOL) would not only make the commuters of tomorrow more like George Jetson, they'd also cut down on pollution! This being the 1970s, Americans were waking up to the fact that our air was absolutely disgusting. But sadly for them, more air travel was not the answer. Boring things like government regulation and the creation of the EPA would have to suffice. The development of aviation by the year 2000 is predicted by experts in air transportation — they expect many thousand-passenger aircraft — Air Force's C5A can already carry over 800 men. Exotic space materials, such as boron filaments and beryllium will be in common use. There will be prototype nuclear-powered planes and passenger service, over 220 billion passenger miles last year will quadruple to a trillion in 2000 A.D.
Air cargo from special cargo airports will equal passenger revenue. Twenty-five percent of all commuting over 15 miles may be by vertical take-off and landing aircraft. If commuting autos were replaced by aircraft to downtown New York, exhaust pollution would be cut by 80 percent! Aviation has indeed advanced since the early 1970s — there's just a caveat to every advance that we actually saw. Nuclear-powered planes were attempted, but they certainly don't participate in passenger service. Vertical take-off planes are becoming commonplace in the military, but they're not used by your average commuter. It's kind of astounding that we're still insisting (or, I should say, that flying car company executives are still insisting) that making air travel more commonplace could be a practical solution to our pollution problems.